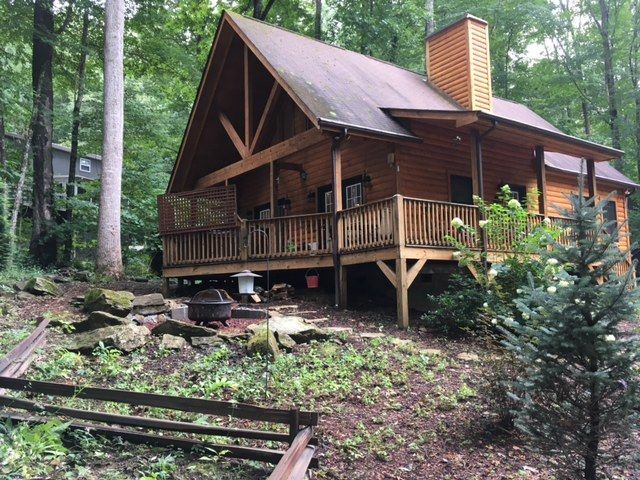 In the heart of Maggie Valley this tastefully decorated cabin is located in a wooded and serene setting. This log sided cabin has an open vaulted great room with a gas log fireplace, wireless internet and cable on a Sony Smart TV with sound bar to enjoy those cozy evenings by the fire. The dining room table seats four with two additional seats at the bar. The fully equipped kitchen has granite counter tops and like new appliances. The master bedroom is located on the main floor with and features a king size bed, cable TV, and connects to a full bath. The 2nd floor contains another large bedroom with walk-in closet, TV/DVD player with a full bath. A spacious loft with queen sized sleeper-sofa and a mattress topper available for added comfort. A phone with free local and long distance service is on the main floor. The porch and deck have rocking chairs, a new 6-person hot tub, deck table with chairs, and a charcoal grill. A fire pit is off the side porch. The cabin has easy year round access with maintained paved lanes and adequate parking. A collection of DVDs, books, games, and puzzles are available in the cabin. It is located in a park- like area that is good for walking with a nearby stream and a picturesque horse farm down the road. Hoot Owl is located minutes from Cataloochee Ski Resort, the Blue Ridge Parkway, Cherokee Indian Reservation, Harrah’s Casino, Waynesville, Asheville, and local golf courses. Make Hoot Owl cabin your destination for your trip to the beautiful Blue Ridge and Smoky Mountains of North Carolina! This cabin was very nice and well equipped. The location was within 10 minutes of the Blue Ridge Parkway and 30 minutes access to the Great Smoky Mountain National Park. There were a couple of maintenance issues. The housekeeping was not complete when we arrived. There were damp towels in the clothes dryer and bathroom rugs piled in the master bedroom. At 3:30AM one morning, the smoke detector in the master bedroom began chirping, indicating the need for battery replacement. We had to search for batteries and use a dining room chair to reach the detector to replace the batteries and eliminate the noise. Also, several light bulbs in the high ceiling were burned out, making the house quite dark. It was impossible to replace those without a ladder and it should have been done by housekeeping/maintenance before we arrived. We have AT&T Wireless for our cell phones and had NO cell phone service the whole time we stayed here. This could be a provider problem for this area, but we feel people should know this about this location. The WiFi was great. We were told we had to provide all paper products--toilet paper, kleenex, paper towels, trash bags. We brought all of those things, but found them all to be in good supply at the house after all. The only thing lacking was no bath soap, which was anticipated and we brought anyway. Also, you have to transport all trash to a locked trash dumpster located behind the rental office for disposal. You will be charged $50 if you leave any trash at the house. This is declared in the rental agreement, but could be easy to miss. The nearest grocery store is about 15-20 minutes drive away, but is quite nice. Lastly, the written directions provided by the management company were not quite accurate and we had to "wing it" in order to find the house. The property itself is quite nice, but all these other issues clouded our impression of the stay. I have told Premier about all these things and have had no reply. Good morning! We certainly apologize for any inconvenience you may have experienced while visiting with us... We try to keep batteries and bulbs in homes at all times because we never know when they might stop working, Yes, Cell service can definitely be spotty in our area. We do suppy 1 each of toilet tissue, paper towels, dish soap , etc. as a starter for our guest but if prior guest happen to leave there our housekeeping team will keep it there for the next guest. We are pleased you found the home clean and well equipped for your stay:) Thank you for sharing these issues with us and we will definitely see that they are brought to housekeeping and maintenance attention. Have a nice day and we look forward to seeing you on your next Smoky Mountain Getaway! The Premier Staff! First time with this company and this house. Loved the house, was set up nice and crew thoroughly enjoyed it. Only wish they had extra garbage bags and the master bed was a little sketchy. BUT we loved it. The fireplace and hot tub after a day of skiing was just what we needed. Will stay here again. Bring food! the kitchen has literally everything you need minus a croc pot. It centrally located in town and only a few minutes from Ski Resort. Awesome! Sounds like you had a great time:) Thank you for the updates and we will check into the master bed and a crock pot :) Thank you for booking with Premier... Have a nice day! The Premier Staff! We are pleased to hear that you had a nice time at Hoot Owl:) We look forward to seeing you again... Have a nice day! The Premier Staff! This place was adorable. It exceeded our expectations in every way. The cabin does have other homes around it, but it was still very private and extremely quiet. The new bed on the main floor was the most comfortable we have ever experienced. The little fire pit was nice to hang around in the evening, and the hot tub was great. Although you feel like you're a million miles away in the mountains, you are only about three minutes to the main road with access to everything. There are wonderful restaurants nearby (Rendezvous is one) and little taverns (Salty Dog), many small breakfast places, pizza places and shops. Two places that are close-by (30 minutes) are Cherokee if you like casinos and Bryson City has a train ride, breweries and shops. Sandy at Premier was awesome. We would go back again in a heartbeat. Awesome!! We are pleased to hear you had a wonderful time for your Anniversary! Hoot Owl is just that... Adorable!! Thank you for the nice comment and we sure hope to see you again in our beautiful valley:) Happy Anniversary! The Premier Staff! Good afternoon! We are pleased to hear you had a Great time at Hoot Owl :) We certainly do apologize for any inconvenience with the Thank you for bringing this to our attention and we will defiantly look into this matter... We appreciate your booking with us at Premier and we hope you have a nice day! The Premier Staff! Awesome!!! Sounds like you enjoyed your stay at HOOT OWL!!! Hope to see you soon:) The Premier Staff!